A growing number of organizations are leveraging cloud computing services to improve the flexibility and scalability of IT services delivered to their end users. Public cloud computing services such as Amazon Web Services (AWS) enables organizations to use externally hosted computing resources on which to run their own applications and services. It is important to continually monitor these business-critical cloud hosted applications to ensure they perform at expected levels at all times and to ensure cloud resources are being effectively utilized. ManageEngine Applications Manager provides deep dive application component monitoring which covers application servers, databases, servers, VMware, web transactions, etc. This along with cloud monitoring capabilities, allow organizations to proactively monitor the health and performance of their critical cloud infrastructure as well as the applications hosted on the cloud. Applications Manager continuously monitors Amazon EC2 and RDS instances and provides insight into the health and performance of these instances to IT administrators. With the aid of comprehensive performance metrics as well as in-depth graphs, you can ensure that your business-critical applications hosted on the Amazon cloud are performing at optimal levels; and can detect and resolve problems in a timely manner. You also gain visibility into the resource utilization of your cloud infrastructure, which in turn helps in capacity planning. With out-of-the-box reports, graphical views, alarms, thresholds and comprehensive fault management capabilities, you can ensure your vital cloud resources are continually operational. Applications Manager automatically discovers all the EC2 instances present in your Amazon account and monitors their availability, health and key performance metrics. 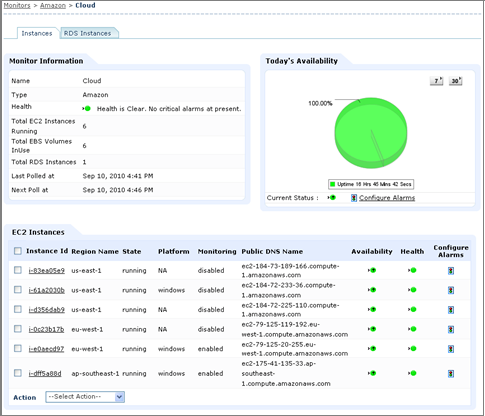 It also provides performance statistics of the Amazon EBS volumes attached with the EC2 instances. Keep track of the health, availability and performance of Amazon Relational Database Service (RDS) instances. Metrics provided by Applications Manager include CPU utilization, Database Connections, Network Traffic, Network Latency, etc. 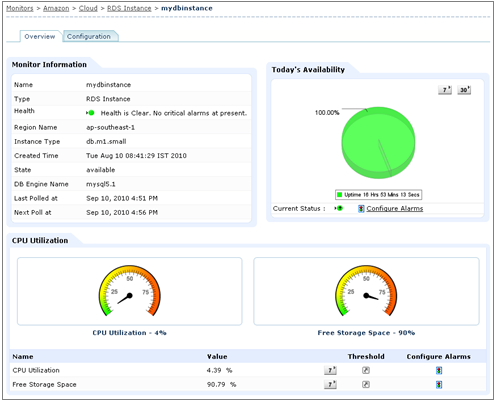 A single console for monitoring your physical, virtual and cloud infrastructure. Monitor applications hosted in the cloud as well as inside your corporate data center. Ensure high uptime and peak performance of your Amazon cloud resources. Gain insight into the performance of your cloud computing environment; troubleshoot and resolve problems before end users are affected. Plan capacity and make educated decisions about allocating cloud resources. The Amazon cloud monitoring feature is available as an add-on to Applications Manager and works with both the Professional and Enterprise Editions.